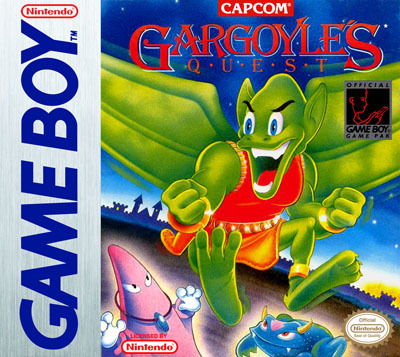 Only one item this go-around, and it’s only because I got sick enough to stay home from work that I had time to check it out: Romhacking.net recently posted a new translation of Gargoyle’s Quest, the Game Boy Ghosts ‘n’ Goblins spin-off adventure released in 1990. It’s fairly easy to sniff out that a lot was lost in translation in this game’s trip to Western shores. For starters, Firebrand isn’t even the right color on the American box art (pictured, right). Also, you can fit a lot more information into a small box of Japanese text than you can the same size box in English. The new translation patch, by someone going by the name Stardust Crusaders (who appears to have done quite a few of these sorts of cleanups), trades the florid script of the original stateside release for a more utilitarian font and re-inserts that missing material, which it turns out is mostly a lot of references to hell and devils and souls and suchlike1Perhaps the most major change is the return of “Rushifell” to its un-lallated form, “Lucifer”., which of course was a huge no-go for Nintendo in the 90s. Since the game is only about two to three hours long if you know what you’re doing, it’s a quick and fun revisit that’s well-served by this new translation.